Fire Truck Drawn Hayrides – FREE! Children and parents alike can enjoy the fire truck hayrides with our classic Center Conway Fire Truck leading the way! All aboard! Join us for BINGO! Bring a candy bar to play, and win some sweets along the way! Delicious Ice Cream flavors with a variety of yummy toppings are provided to make your own ice cream sundae! Wednesday and Saturday nights. Fee applies. Paint your own T-shirts, totes, and bandanas! Please ask cashier in store for details. Junior pick-up soccer and wiffle ball games and pet talent shows. Activities are subject to change and are available Friday, June 21st through Labor Day, unless otherwise specified. Please check with the ESCA store for scheduled events during your stay. Memorial Day Weekend Kick off your summer with us Memorial Day weekend! Bring the whole family to this fun-filled dancing event, with a DJ Dance Party! It starts at 5:00PM and goes until 9:00PM. Fun for all ages and free! The Dog Days of June No fees for dogs, and free treats! Sign your pup up for our dog talent show, Saturday afternoon, followed by a pet costume parade. Bike Week / Father’s Day Weekend All dads receive $20.00 off a canoe or double kayak rental. Click here for Bike Week information. Fourth of July Week Themed hayrides, patriotic site decorating contest, and more! Thomas the Tank Engine is Coming to Town! 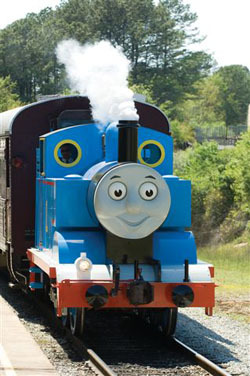 Don’t miss Day Out With Thomas, live at the Conway Scenic Railroad, just 5 minutes north of Eastern Slope Camping Area! (4 day minimum) Say goodbye to summer with our Dance Party featuring DJ Ram Jam! Halloween Weekend Get spooked by our Halloween weekend! Monster mash, costume parade, site decorating contest, and site-to-site trick or treating with prizes awarded. Fryeburg Fair People come from all over New England and beyond to attend the world-famous Fryeburg Fair. Just 15 minutes from Eastern Slope Camping Area, this event is not to be missed! Check out the Fryeburg Fair while you camp during the beautiful fall foliage season! Columbus Day Weekend Come celebrate Columbus Day Weekend with us! Join us for the 6th annual ESCA chili cook-off. Registration required. Activities are subject to change and are available Don't forget to visit the Mount Washington Valley Chamber of Commerce website for all sorts of family activities, fun events, promotions, deals and more! The MWVCC offers the best resource for everything that is going on in the North Conway and Mount Washington Valley Area, and is a must see guide for your camping vacation at Eastern Slope Camping Area!